So, a little while back, I had my parents and my aunt Laura and her partner all over for dinner and then to see some of the paintings and drawings I did during my art course in Italy. I wanted to make something special, and I decided to use my precious home-grown tomatoes to show everyone just how much I actually love them. If there's One Food that says "summer!" to me, it's definitely tomatoes. Especially home-grown tomatoes. The last couple of years I've been dry-farming my tomatoes, which basically means you just water them when you plant them, and never again. 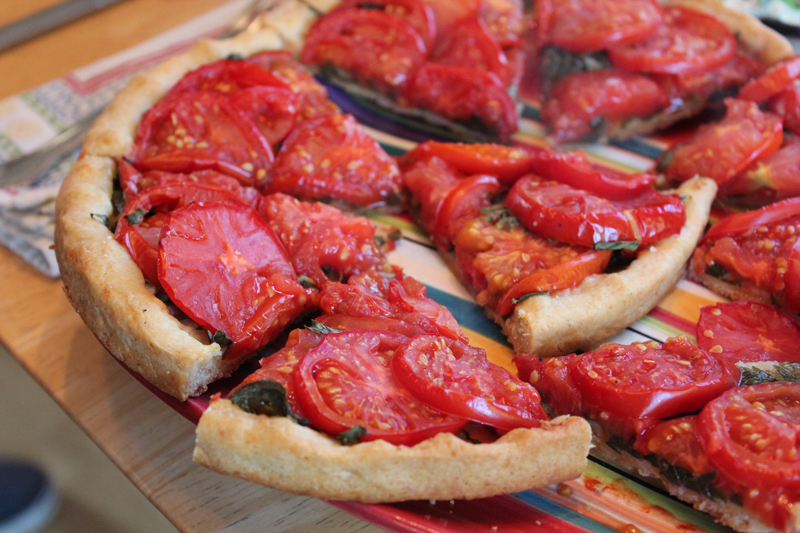 The result is fewer, smaller tomatoes that are packed with the flavor of 6-7 regular tomatoes. They are so amazing! And sweet! and super dark red! Before I left for my big trip to Italy, I was feeling sad that all the tomatoes would ripen while I was gone. But, happily, upon my return, I saw that there were still loads of tomatoes left for me. There were even enough that I could lighten up on my greedy-Golum tendencies and share my tomatoes with my loved ones. This idea was inspired by the Salad Samurai cookbook, but I went my own way with it. First, I made a big batch of my favorite tofu ricotta. 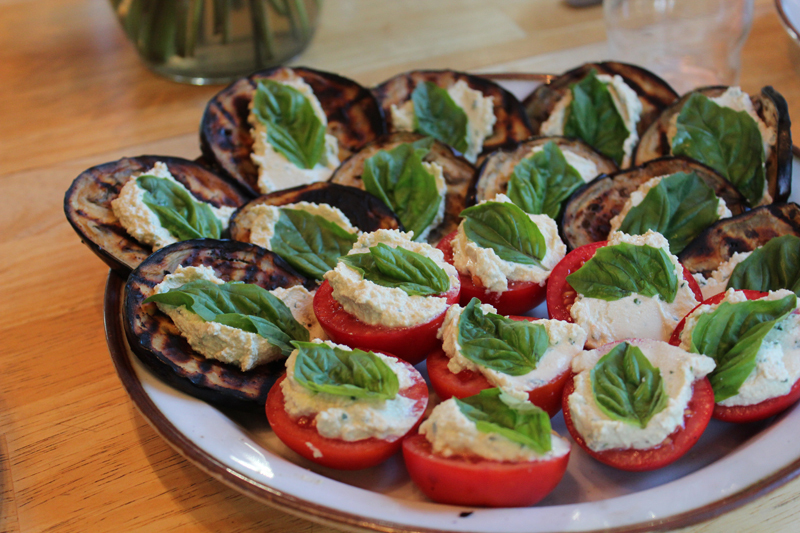 Then I grilled up a bunch of eggplant slices, and sliced some tomato halves, piled on a generous dollop of tofu ricotta on each one, and topped with a fresh basil leaf. These look so cute, they were very tasty, and extremely easy. I also made some crazy good corn-meal-crust pizzas. I used the store-bough pizza crusts from a brand called Viccolo. Their crusts are so extremely good! My favorite way to prepare them is with a crushed garlic clove or two, and a drizzle of good quality olive oil. First I rub that combo all over the crust. Then I layer on a mountain of fresh, super thin julienned basil. On top of that go all the tomatoes. Too many tomatoes will make the pizza soggy, so I do have to practice a little bit of restraint. At the very end, I sprinkle on some large flake salt before baking. So delicious! Like me, my aunt and her partner are also vegans, but they are also really committed to a no-sugar, no-oil, no-salt diet ~ which is not how I typically cook. They pretty much never make exceptions, which means that when we have family meals, they usually just bring along their own food. I wanted to try my hand at cooking for them, even though I don't usually cook that way. 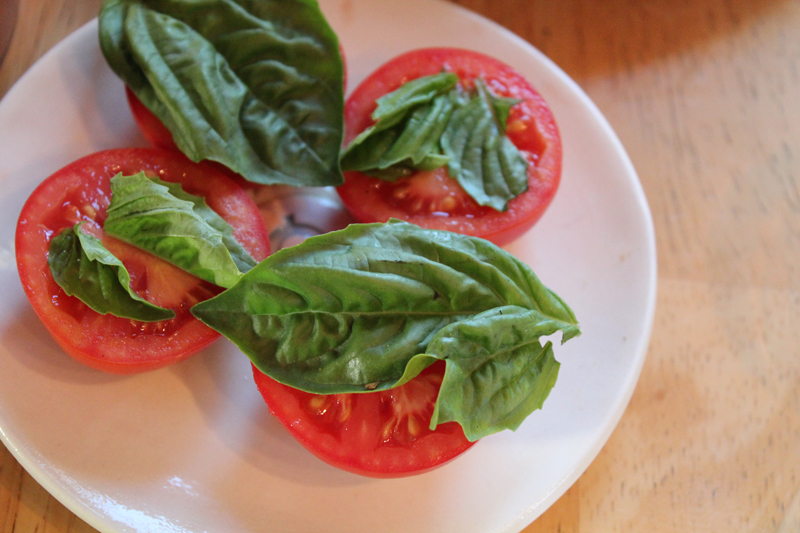 I made them some tomatoes too - just tomatoes and fresh basil leaves. And for their dinner, instead of pizza, I made them a giant mountain of grilled veggies (no marinade), and then I made a summery tomato sauce to serve with the veggies. The sauce had roasted tomatoes and garlic cloves, fresh basil, soaked cashews, some dried herbs, and some lemon juice. I thought it turned out pretty well, and I hope they liked it! It was sort of a funny turning of the cards. Usually, if I am going to someone's house for a dinner, I will just offer to bring my own food. Sometimes, they will be eager to try to cook something for me, and I am always so grateful because I never expect it. Recently I went to a friend's house for dinner and they had found some vegan recipe online, because they were totally not used to cooking vegan. She was nervous about whether it had turned out or not (in the end, we all agreed that it was pretty good). It was funny for me to be on the other end, hosting someone with a more restricted diet than my own and feeling nervous about whether or not they would like it. ha ha! 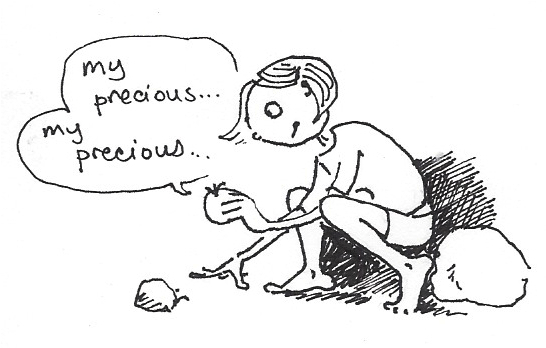 I love the tomato-gollum drawings! All your tomato recipes look great, I'll definitely have to try some of them. I really love this style of eating - little bites you can pick at. Looks like a lovely spread! Oh, that is good to hear about your success dry-farming tomatoes. 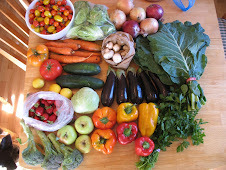 I didn't plant a garden this year because of the drought but I should have done the tomatoes. Next year, I will try that! 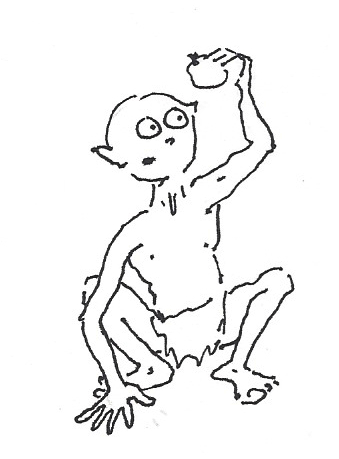 Your Golum-self cracked me up! Your homegrown tomatoes are so beautiful and bright! That cornmeal crust pizza looks awesome. I had never heard of dry-farming tomatoes. I think I would end up killing mine if I tried it. What's the opposite of having a green thumb? A red pinky? Anyway, that's what I have. 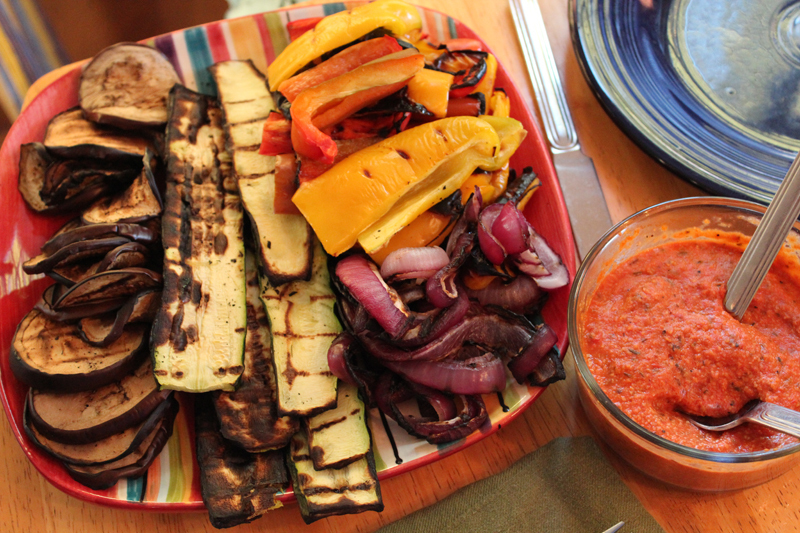 Your big plate of grilled veggies actually looks very delicious. Lucky dinner guests! I love those Vicolo cornmeal crusts! I discovered them about 7 years ago, and they've been a regular staple in my freezer ever since. They're so handy for a quick, tasty meal. You make the tomatoes sound soooo good. There's really nothing like a summer tomato. I'm going to miss them! How nice of you to try your hand at cooking for your aunt and her partner. I'm sure they really appreciated it!